Toss cucumber with 1 tsp salt in colander. Let stand and drain in sink for 20-30 minutes. Squeeze well to remove liquid. In a small bowl, combine cucumber with yogurt, garlic, cilantro or mint and cayenne. Season with salt, if desired. Cover and refrigerate for up to 2 hours. Preheat oven to 400°F. Brush lamb all over with oil. 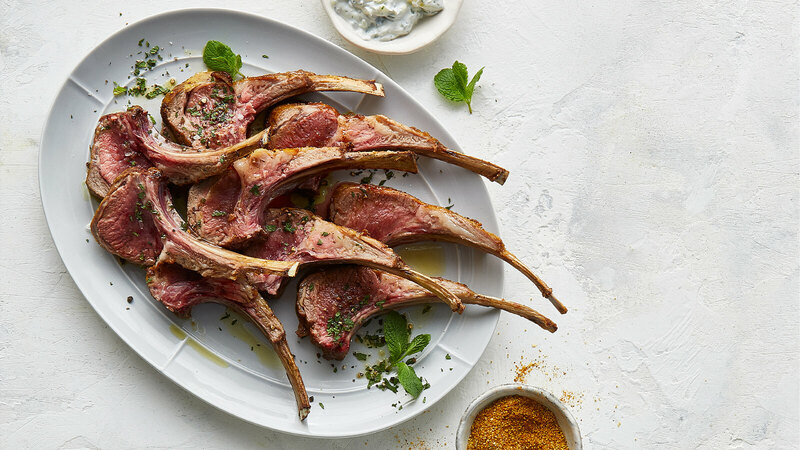 Using a thin knife, trim excess fat cap from lamb racks, leaving a thin strip of fat on top of each. Brush lightly with oil. Season racks with remaining 1 tsp of salt and the pepper. Heat large skillet over high heat. Add 1 rack and sear until browned, about 3 minutes. Repeat with remaining rack. Pour out fat from skillet and set skillet with drippings aside; do not wash.
Sprinkle each rack with 2 tsp rub. Arrange racks in roasting pan, bones facing each other and interlaced so racks will stand. Roast until instant-read thermometer inserted into center of racks reads 130°F for medium rare, 20-25 minutes. Let stand 5 minutes. While racks are roasting, heat skillet with drippings until sizzling over high heat. Add broth and bring to a boil, scraping up browned bits in pan with wooden spoon. Boil until slightly reduced, about 3 minutes. Set jus aside. Cut racks between bones to make 16 chops. Arrange on platter and pour jus over chops. Sprinkle with salt and pepper to taste and drizzle with olive oil. Garnish with cilantro leaves. Serve immediately with the cucumber raita.